There is always coffee somewhere. Twenty-five, is the number of coffees that the annual Good Food Awards has announced as its 2019 finalists. And these twenty-five coffees are about to be everywhere they can be in the next couple months, if they haven’t been already. Last year, Ethiopia – yes mama Africa – swept the 2018 awards with coffee roasters representing from California to New Jersey. The nominations often full of known and newly acquainted coffee roasters are an opportunity to explore deeper into the origin of a coffee and the roaster that has developed its profile. Aiming to redefine good food and for this culture, coffee especially, these finalists, like nominated actors in an industry award system these roasting brands will receive increased attention with many more eyes on them and the beans they roast. With hundreds and hundreds of independent roasters in our nation, having this Awards champion the good in food that they are creating allows us as explorers of coffee to make connections beyond our familiar. California leads the finalists with five nominations; there’s a newcomer whose name alone – Drink Coffee, Do Stuff – gets this culture and the mountain people’s attention, there’s Oregon, Washington and Texas each coming in second with the former state getting a back-to-back nod and 2018 win for Noble Coyote Coffee Roasters’ roasting – both from the Gugi Highlands of Ethiopia. And, on a personal note, the founder of this webzine’s late great-grandmother was raised in Oak Cliff, Texas, thus, for a specialty coffee – Oak Cliff Coffee Roasters – to be coming out of this town with a GFA nomination is especially noteworthy. This year’s tally is Arkansas (1), California (5), Colorado (1), Georgia (1), Illinois (1), Ohio (1), Oregon (2), Maine (1), Massachusetts (1) Minnesota (2), Montana (1), New Jersey (1), Pennsylvania (2), Texas (2), Virginia (1), Washington (2). Here’s to drinking well into 2019 when the Awards ceremony will occur on January 11 and the subsequent marketplace will be held on January 13. 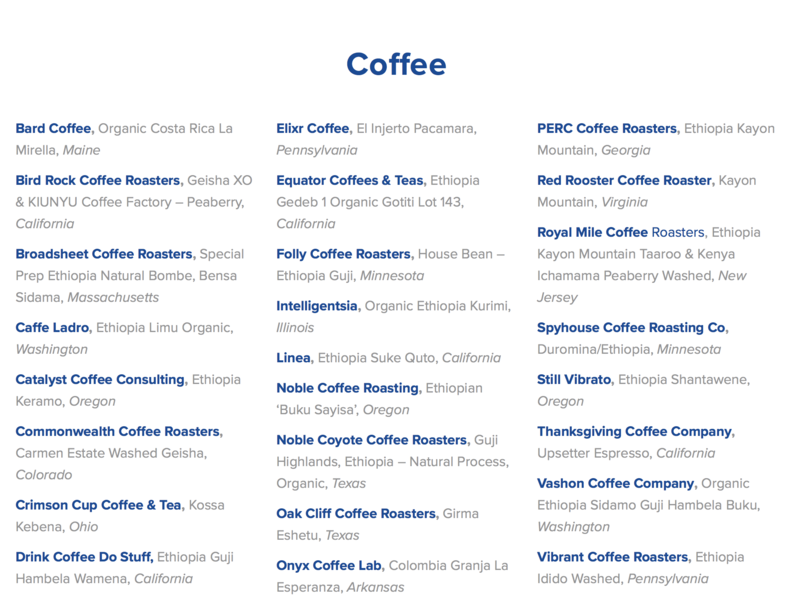 This entry was posted in coffee and tagged Arkansas, bard coffee, bird rock coffee roasters, broadsheet coffee roasters, caffe ladro, california, catalyst coffee consulting, colorado, commonwealth coffee roasters, crimson cup coffee and tea, drink coffee do stuff, elixir coffee, equator coffees and tea, folly coffee roasters, Good Food Awarads, illinois, intelligentsia, linea, maine, massuchusets, minnesota, montana, new jesey, noble coffee roasting, noble coyote coffee roasters, oak cliff coffee roasters, ohio, onyx coffee lab, oregon, pennsylvania, perf coffee roasters, red rooster coffee roaster, royal mile coffee roasters, spy house coffee roasting co, still vibrato, texas, thanksgiving coffee company, vashon coffee company, vibrant coffee roasters, virgina, washington. Bookmark the permalink.